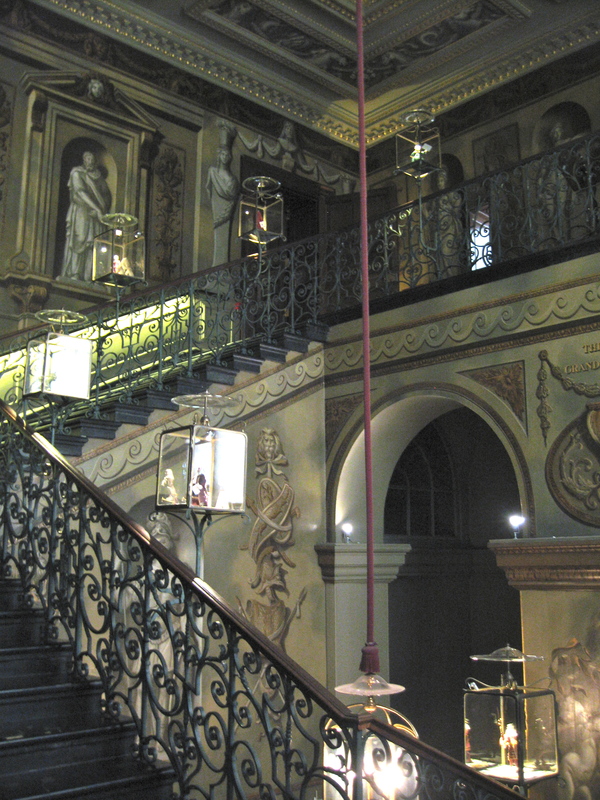 We spent a morning at Kensington Palace earlier this week. Another glorious early September day in London. 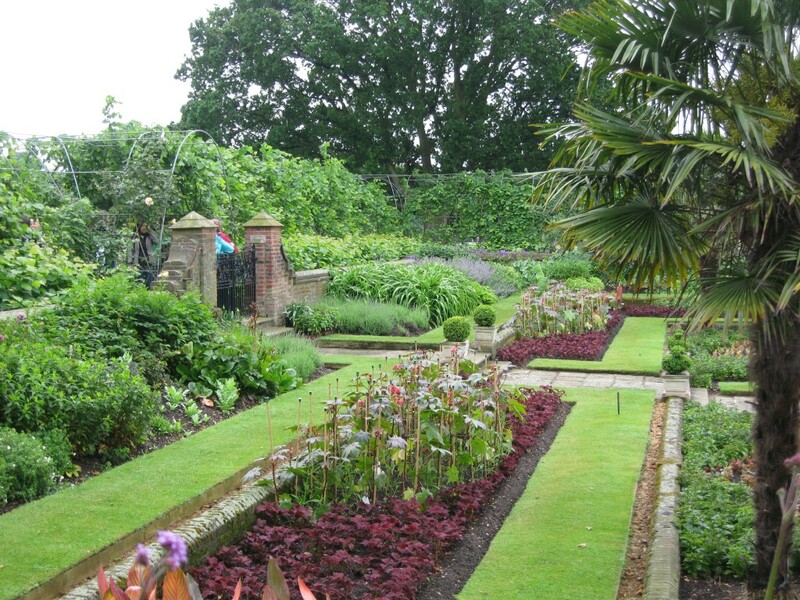 The Sunken Garden. Photo by me. 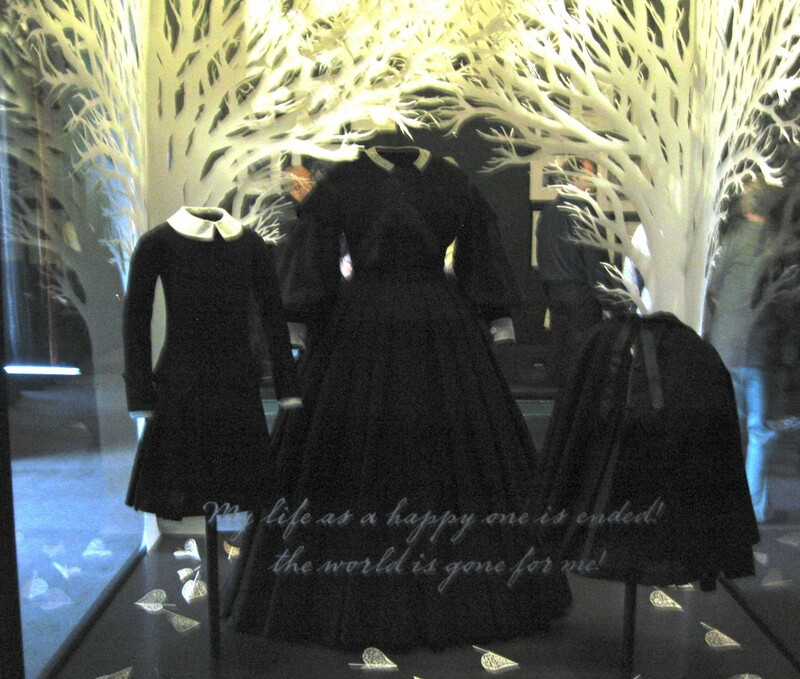 I wanted to visit the palace again and see the new Fashion Rules exhibition. The public entrance to Kensington Palace. Photo by me. 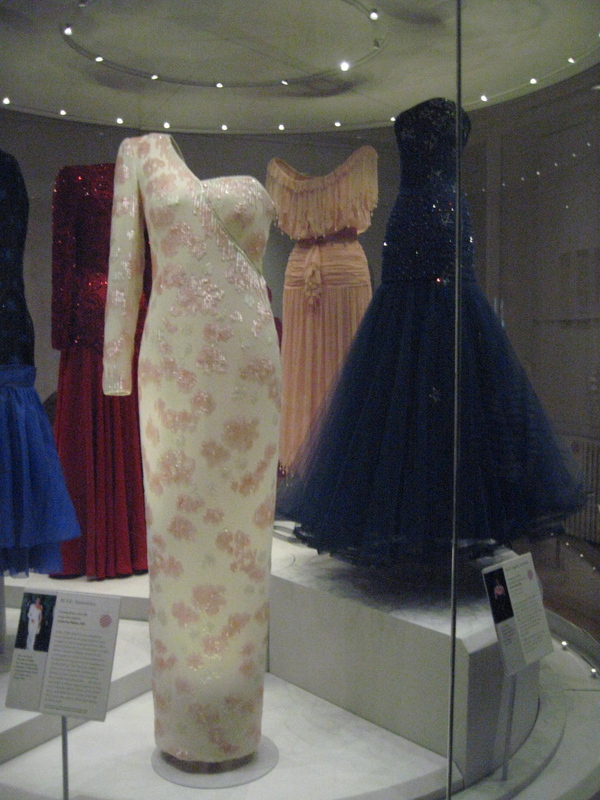 New this year, the exhibition of dresses from the collections of HM The Queen, Princess Margaret, and Diana, Princess of Wales has proved to be very popular. 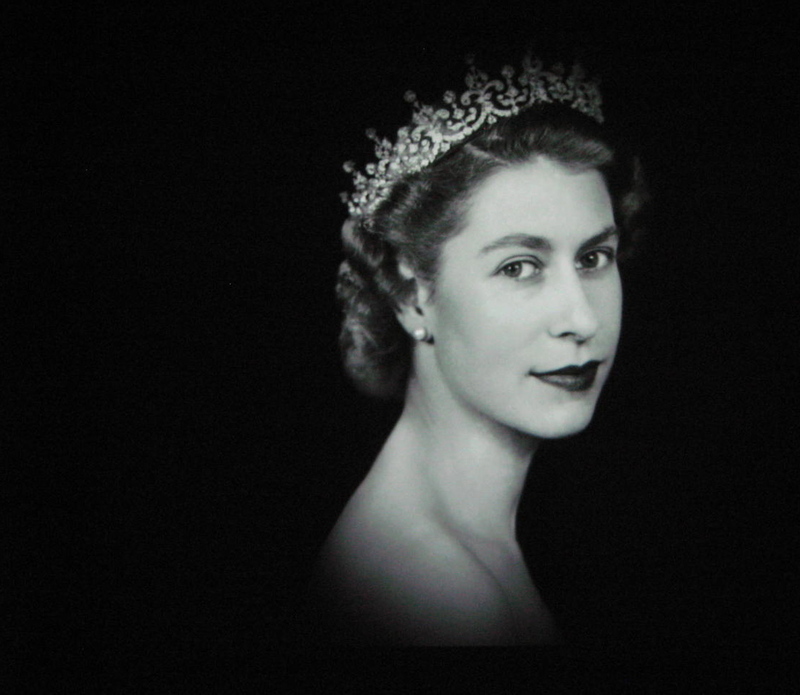 The 1950s: HM The Queen. Photo by me. The workmanship and style of the dresses was amazing. 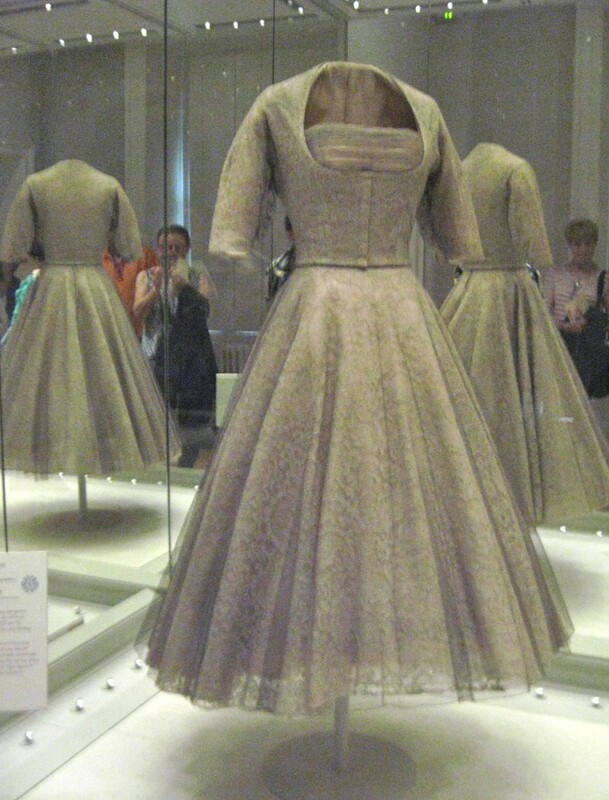 It was fabulous to see the craftsmanship of the garments up close. 1960s and 70s Princess Margaret. Photo by me. It really did recall a specific time vividly through fashion. The card said the fur added some warmth to the coat. My Beloved Brit reckoned they were kidding. Photo by me. 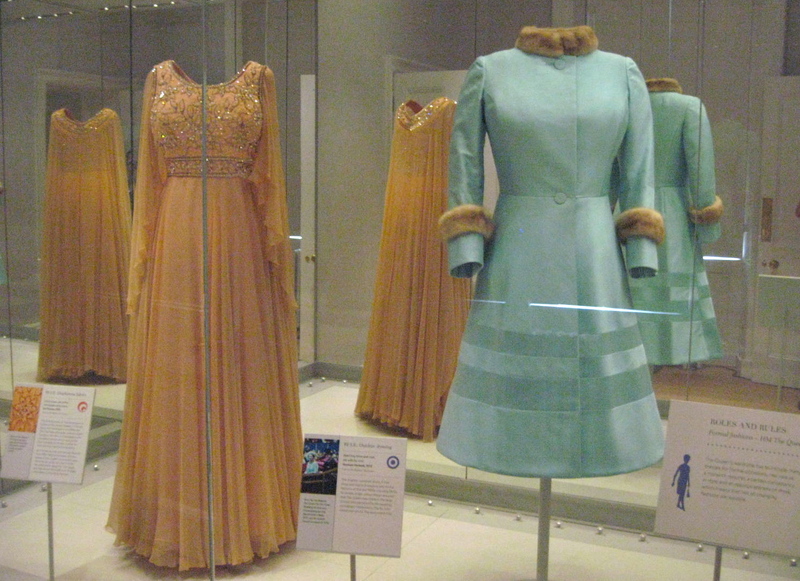 A past era, revisited in cloth and color and style. Elizabeth I. 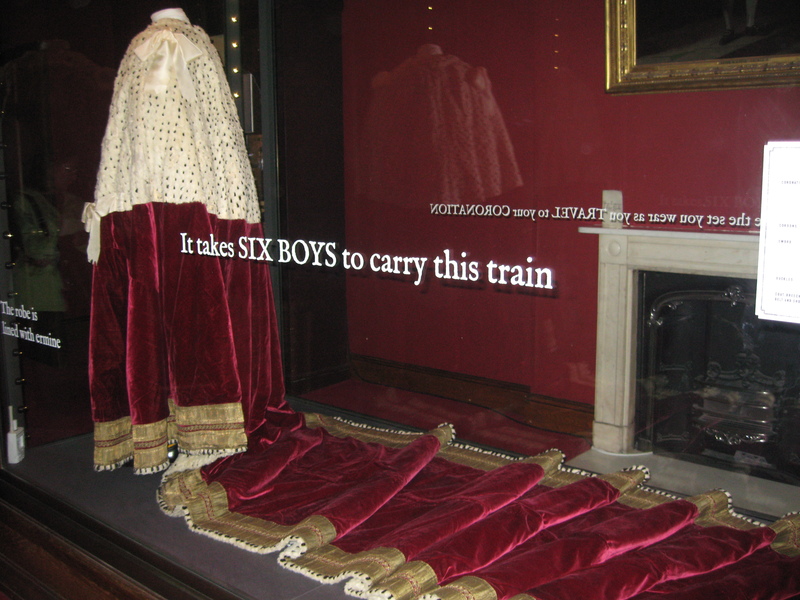 Photo by me of the exhibition film. 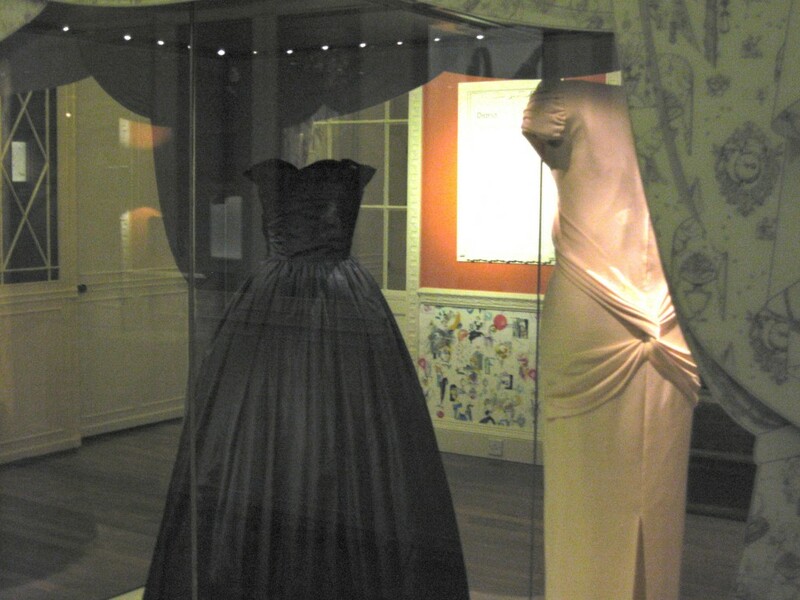 The Diana, Princess of Wales display featured five gowns that looked so familiar from past newspaper photos. For the Japan State Visit, a dress the color of cherry blossoms on the left. Photo by me. 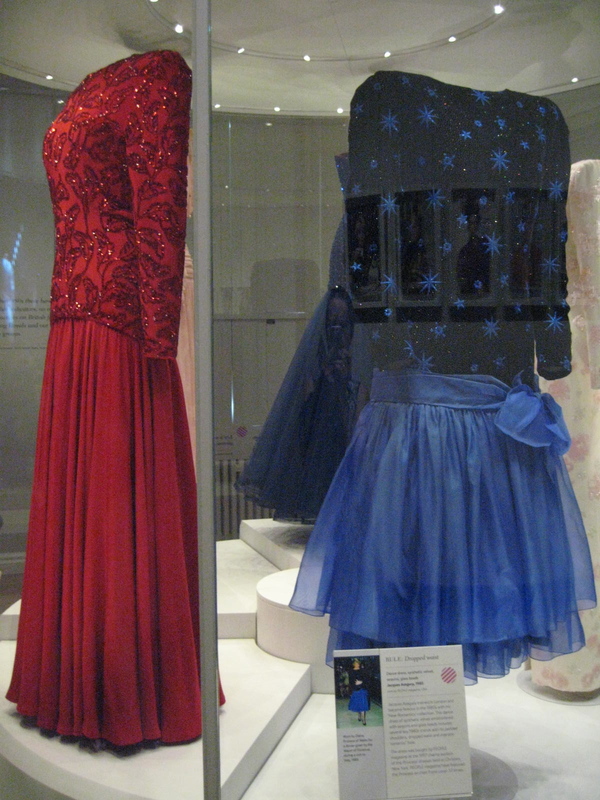 I remember when she wore this dress with the metallic stars–she was such a style icon. Photo by me. 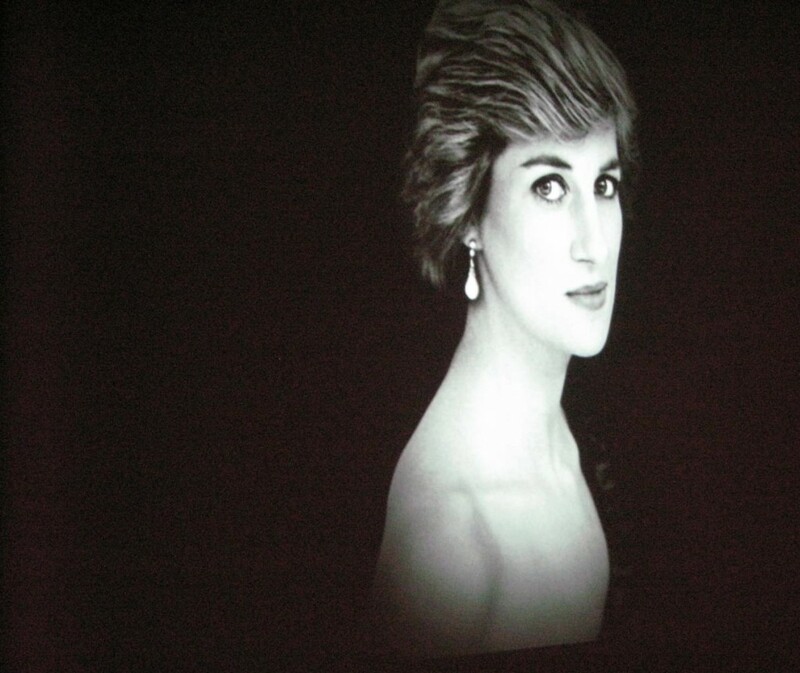 Photo by me of the exhibition film. 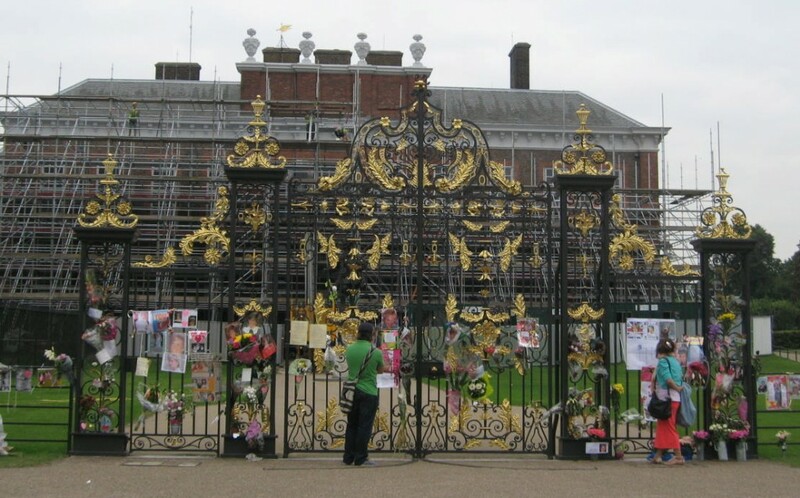 And outside the palace, the golden gates on the south side were decorated with notes, clippings and floral tributes in memory of the princess. It was the anniversary of her death on August 31st, and there were reminders throughout London. 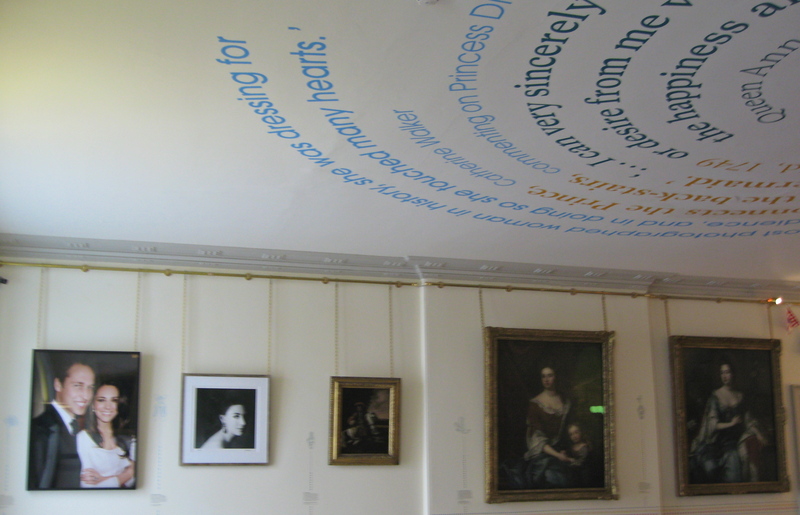 Kensington Palace had been her home where she raised her boys, so here more than anywhere there were thoughts of her life. 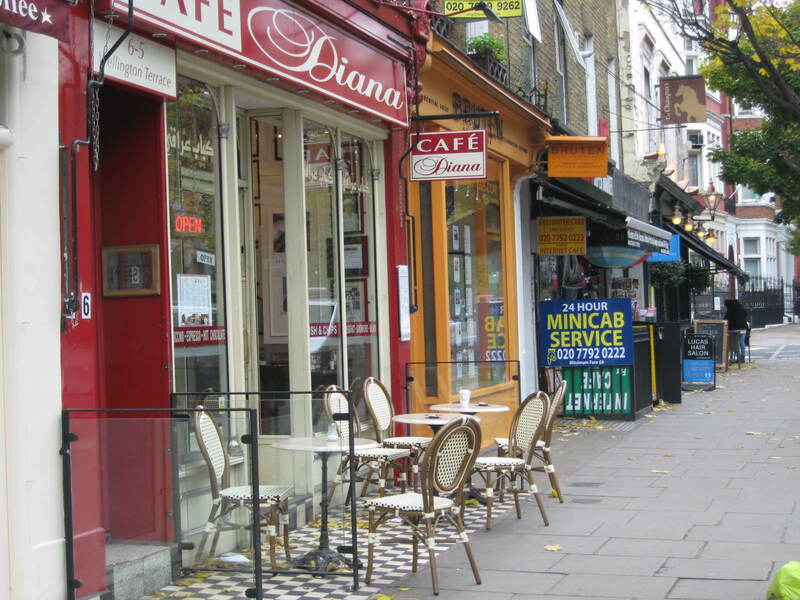 Even across the street from the palace road, a cafe helps keep her memory alive. Cafe Diana across from the palace road. Photo by me. 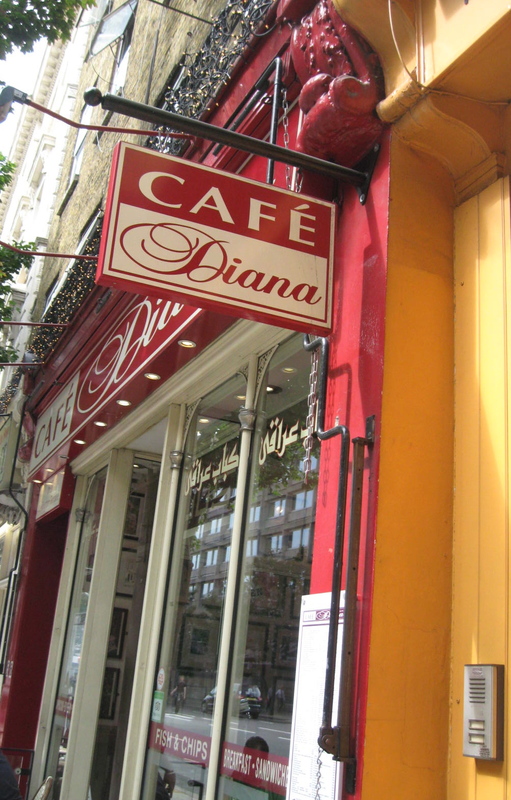 And then there is the future, celebrated at this same cafe Diana herself used to pop in to for a cold drink. In celebration of baby George. Photo by me. The line of a tradition carries on. 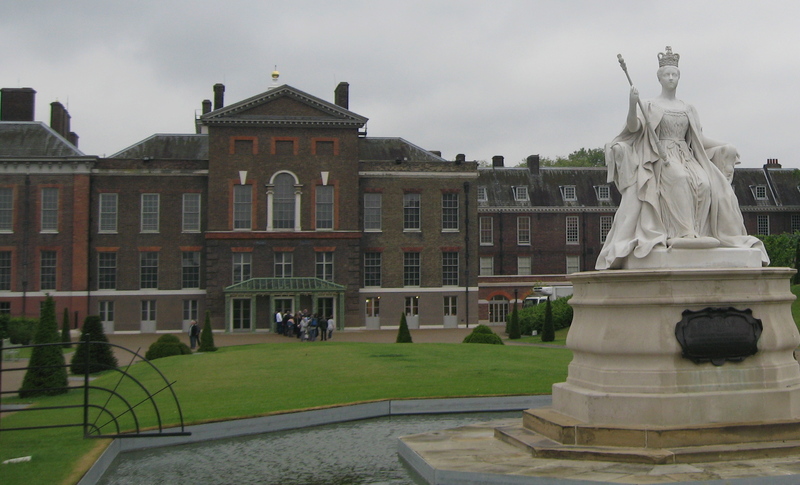 William and Kate, otherwise known as The Duke and Duchess of Cambridge, move in to their new quarters at Kensington Palace sometime before the end of this year. It is the beginning of a new and more visible royal role for the couple, as they ease ever more quickly into a very public life. They must have mixed feelings about the move, but excited especially with the new baby due in the next month. 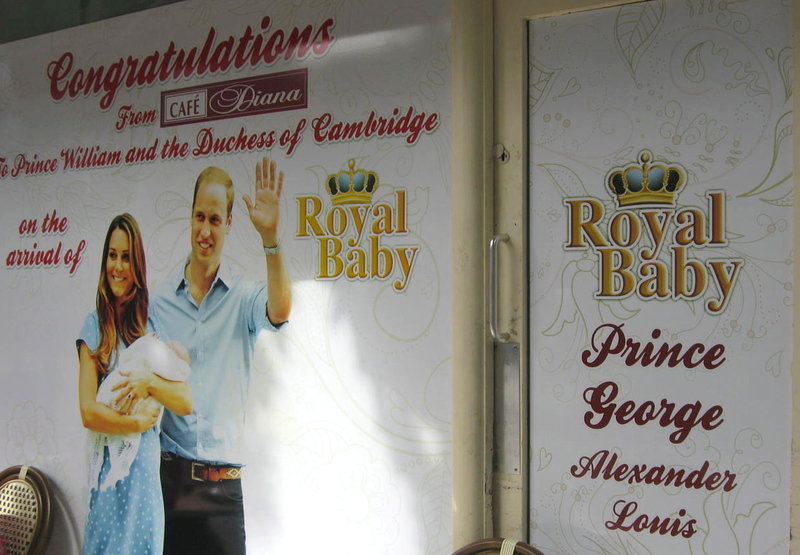 They will soon live in Apartment 1A, formerly the home of Princess Margaret. 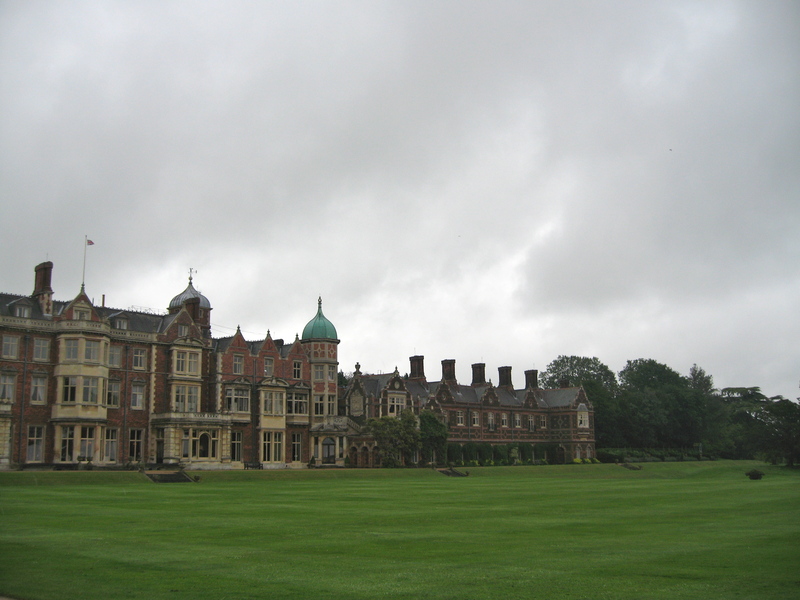 Up to now the apartment has remained unused since Princess Margaret’s death in 2002. 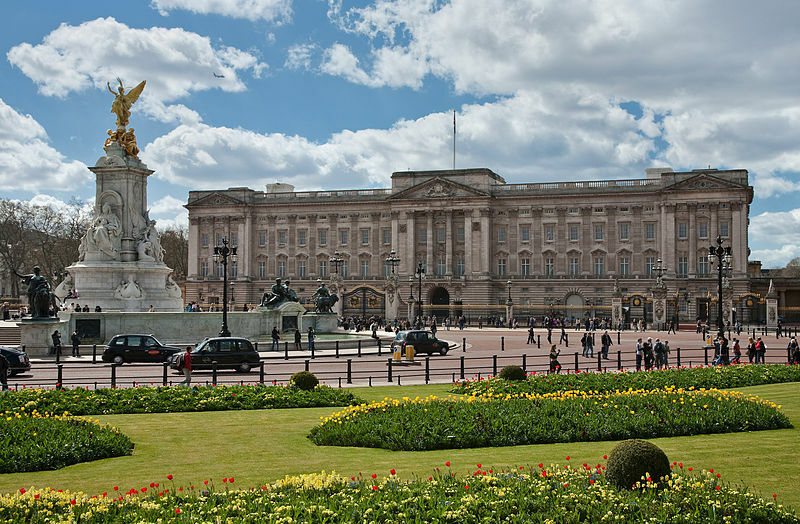 They currently have a small, two-bedroom apartment residence at the palace. When I walked by Kensington Palace this past November, I noticed workers busily installing great black iron spikes along the top of this lovely garden wall. Increased security I’m sure. A strange world we now live in. There was also extensive rewiring, new plumbing and the removal of asbestos. What fun to decorate all 20 rooms, including a nursery. The Duchess has had her last public royal appearance before the birth of the baby, and I am sure she will use some of that quiet time to finish furnishing her new home. I can only wish them years of happiness raising a family is this idyllic place. 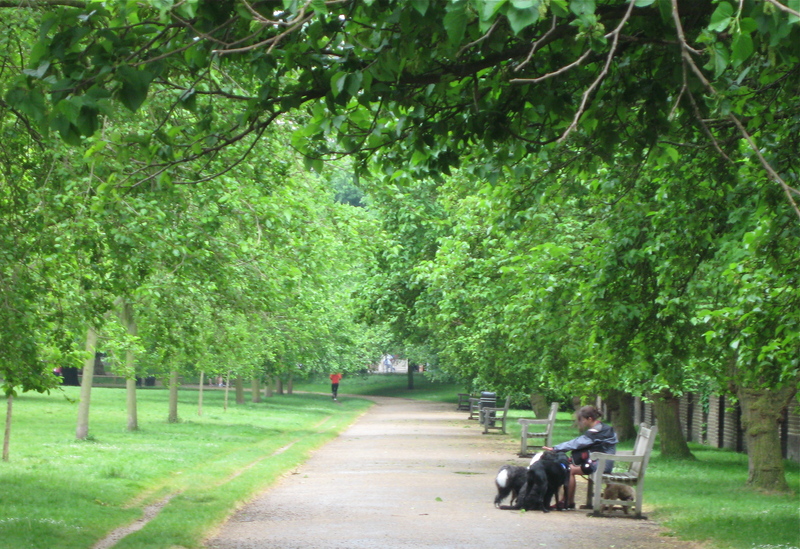 One of my favorite parks in London is Kensington Gardens. 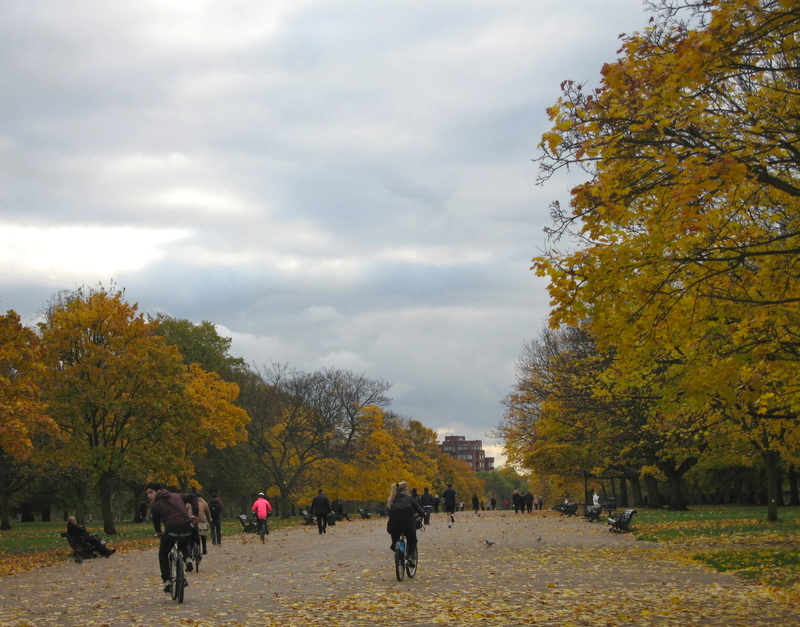 Entering Kensington Gardens from the Notting Hill side in autumn. Photo by me. I discovered it last year, and since then I can’t stay away. 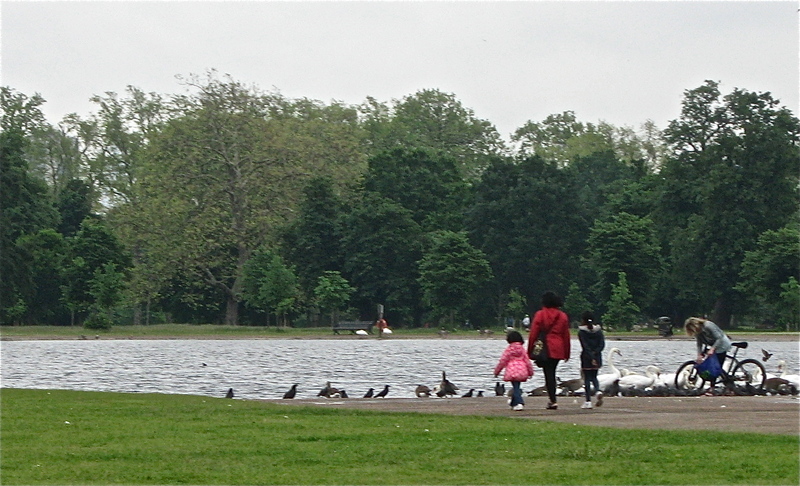 Kensington Gardens’ Round Pond. The perfect spot on a summer’s day. Photo by me. 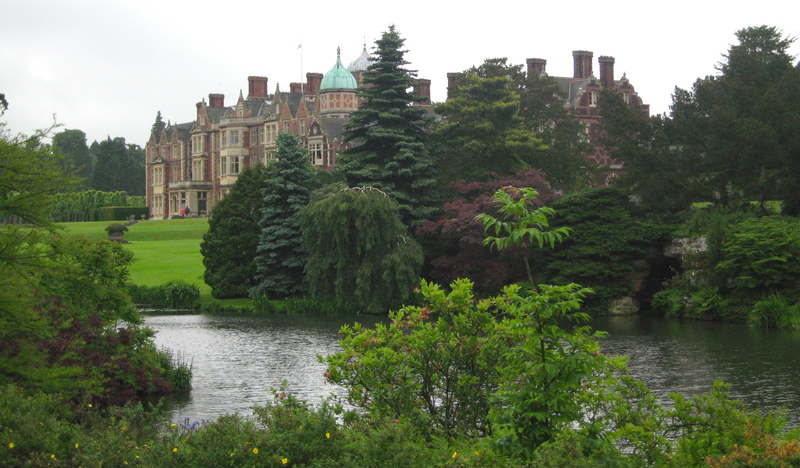 …to join with Hyde Park on its eastern border. 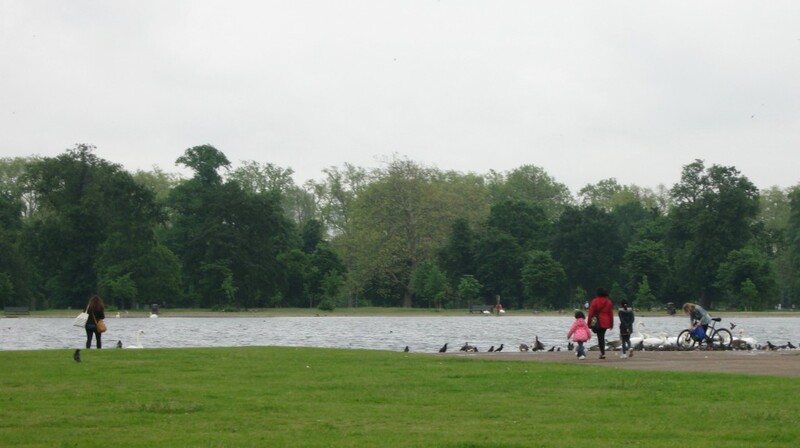 On the western side of London, Kensington Gardens is next to one of the most desirable areas in London– Kensington–known for some of the best shopping in the city. 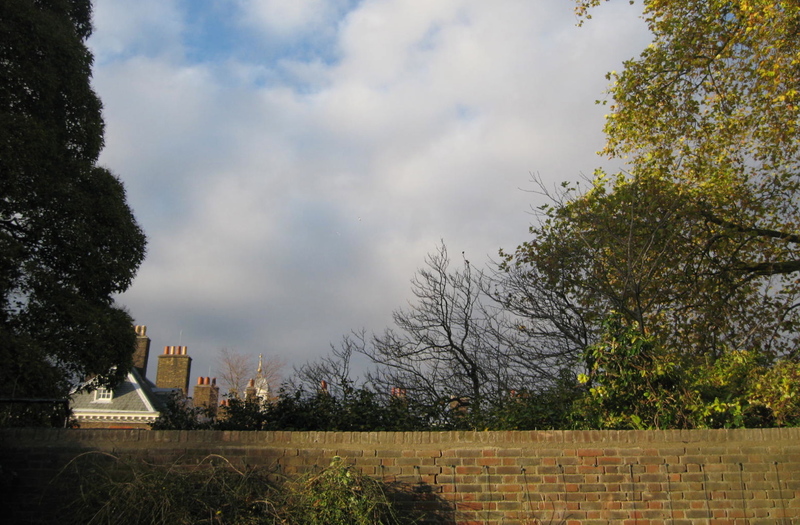 It is also very near the popular Notting Hill neighborhood and the famous Portobello market. 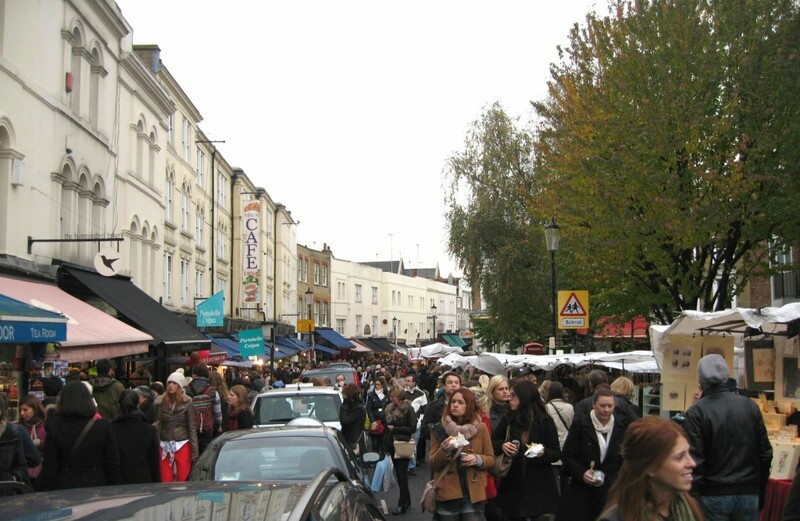 A crowded Sunday afternoon shopping on Portobello Road at the market. Photo by me. 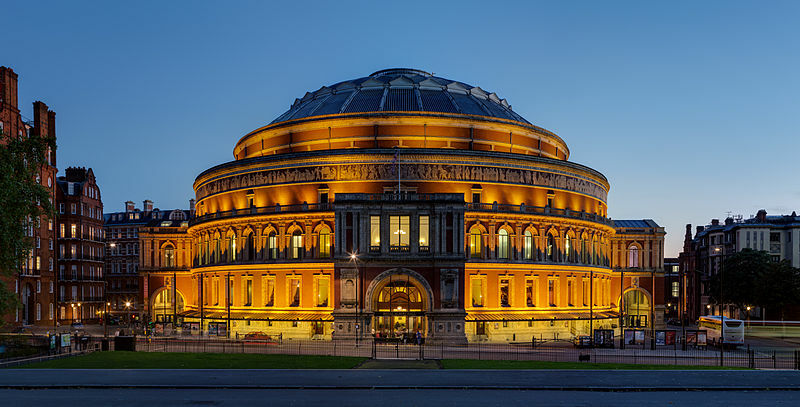 To the south of the park is the famous concert hall, The Royal Albert Hall, best known for holding the annual summer Proms concert since 1941. 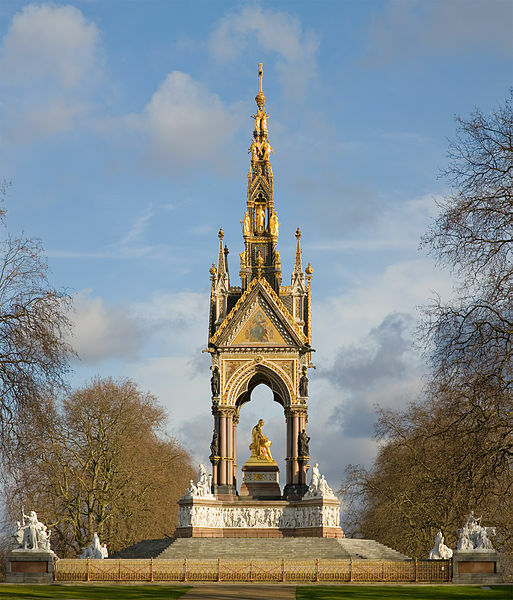 It is right across from the Albert Memorial Gate entrance to the park and the Albert Memorial on Kensington Road. 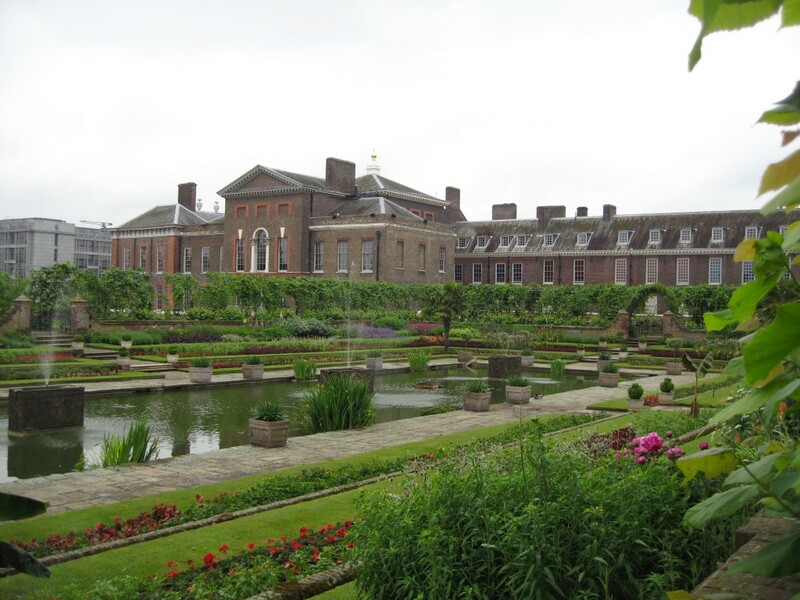 And of course right inside the gardens on the west side of the park is Kensington Palace, the London home of the Duke and Duchess of Cambridge (Will & Kate) and Prince Harry. 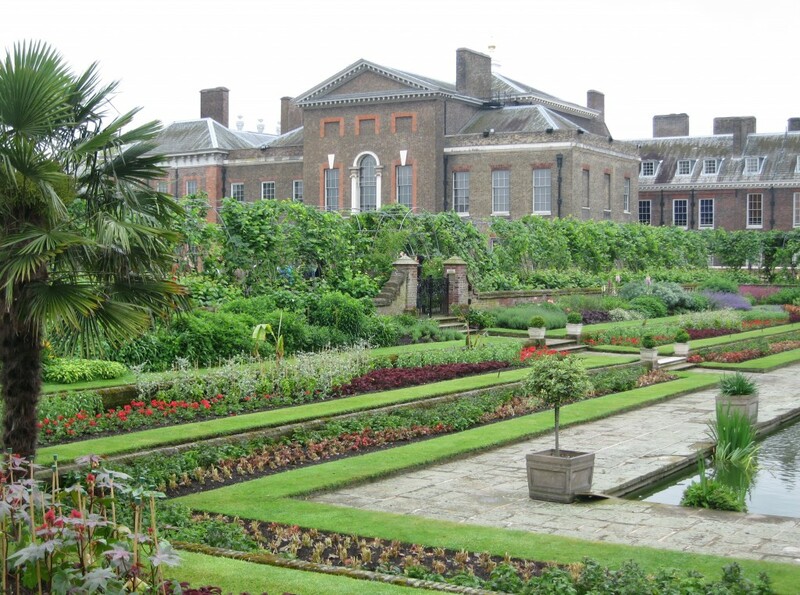 Kensington Palace from the Sunken Garden in June. Photo by me. 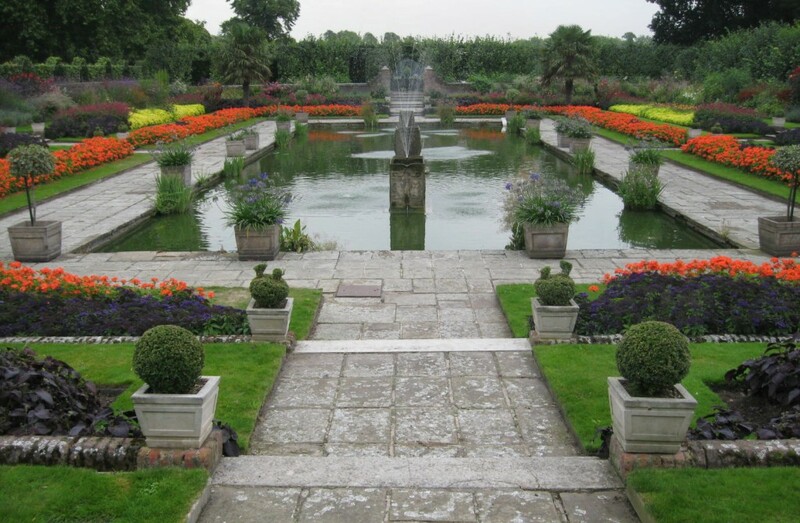 The Sunken Garden outside the palace, on the edge of Kensington Gardens. Photo by me. 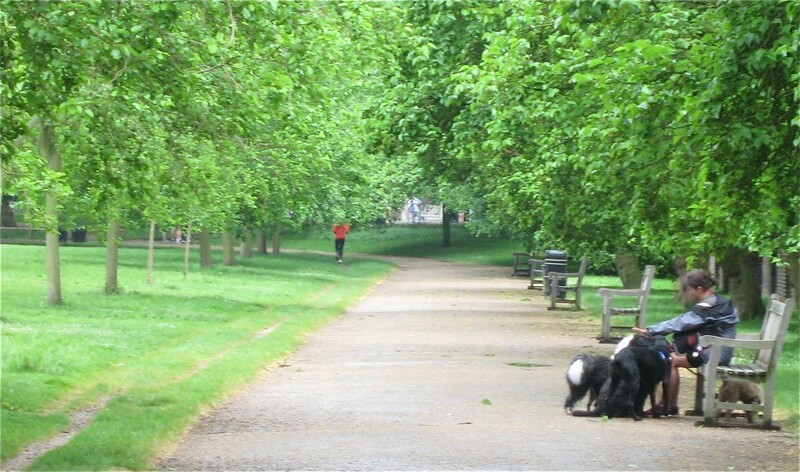 Kate has been known to walk Lupo in the park with her security guard at her side. But so far I have not been fortunate enough to run in to them. 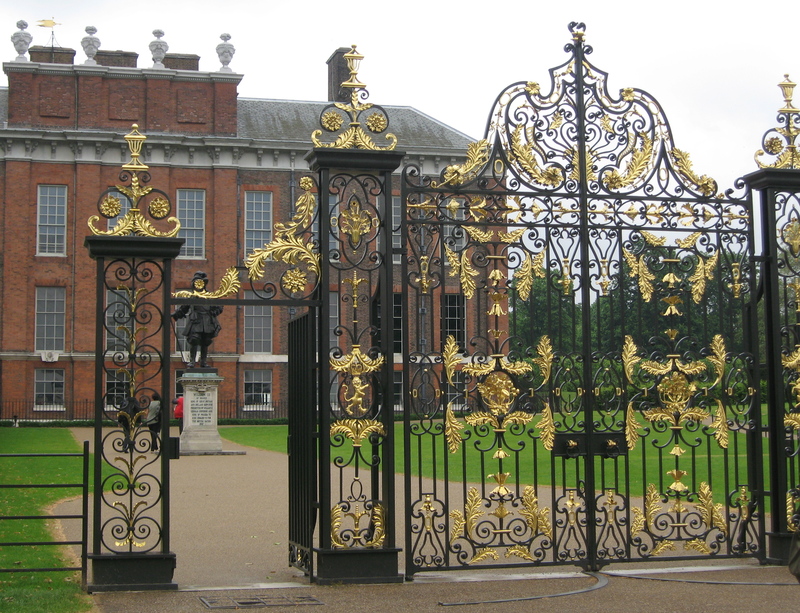 The gates between Kensington Palace and the park. Photo by me. There are lots of dog walkers in the park, and to be a “commercial dog walkers” you do need a license to “operate” in the royal parks. 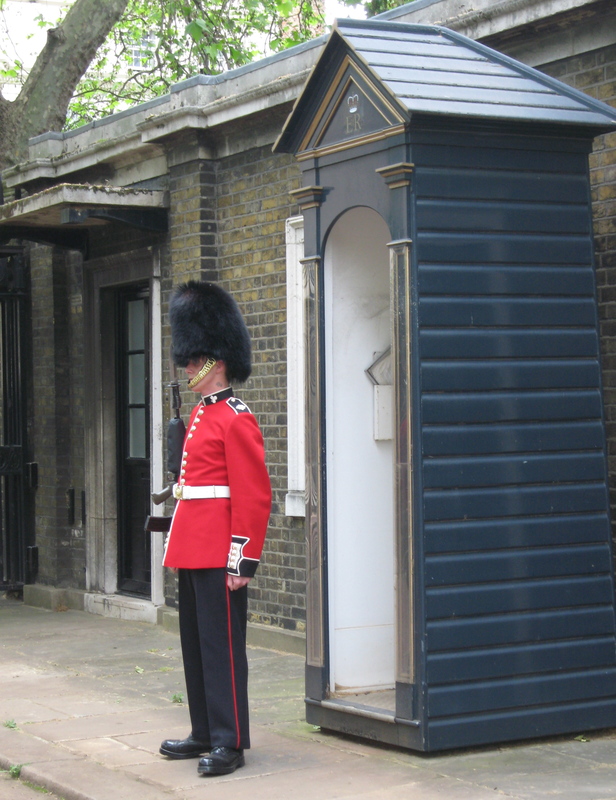 But these British dogs seem very well-behaved, following all the rules…most of the time. A dog walker takes a break in KG. Photo by me. You are very aware of the royal residents who used the park as their backyard. 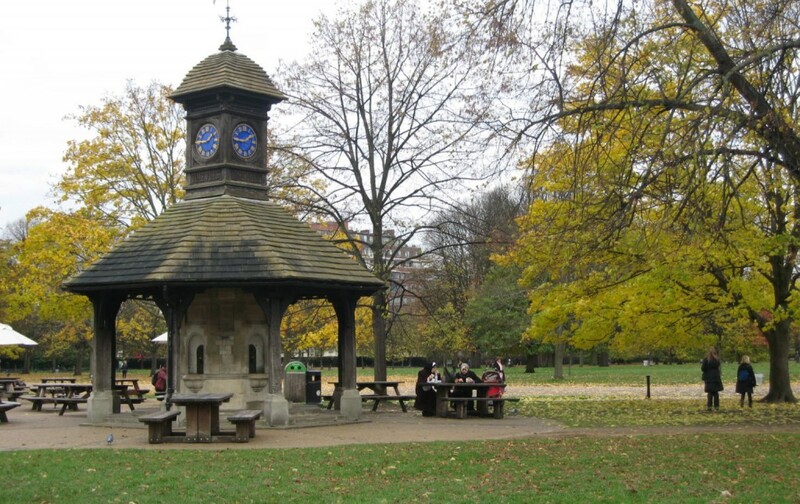 This small cafe is next to The Princess Diana Memorial Playground. One of several small shelters to stop and sit and enjoy the park. Photo by me. 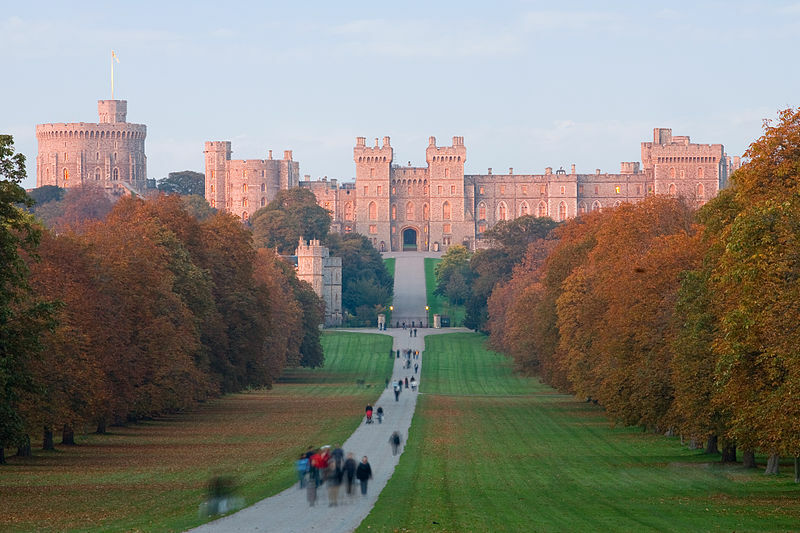 Word has it that the Princess stopped for coffee at the small shop that now bears her name which is right outside the gates that lead to the palace. The Diana Cafe where I stopped for lunch on my walk around the park back to my hotel. Photo by me. 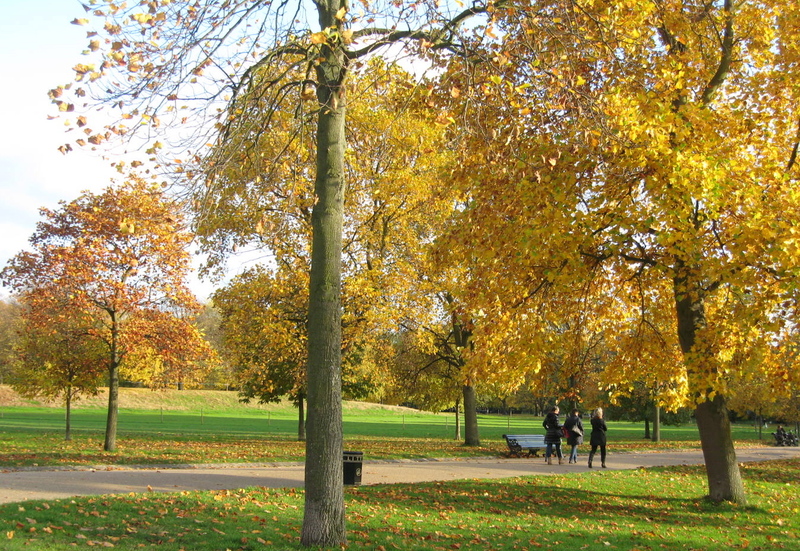 But it is the beauty of the park itself that keeps me coming back. 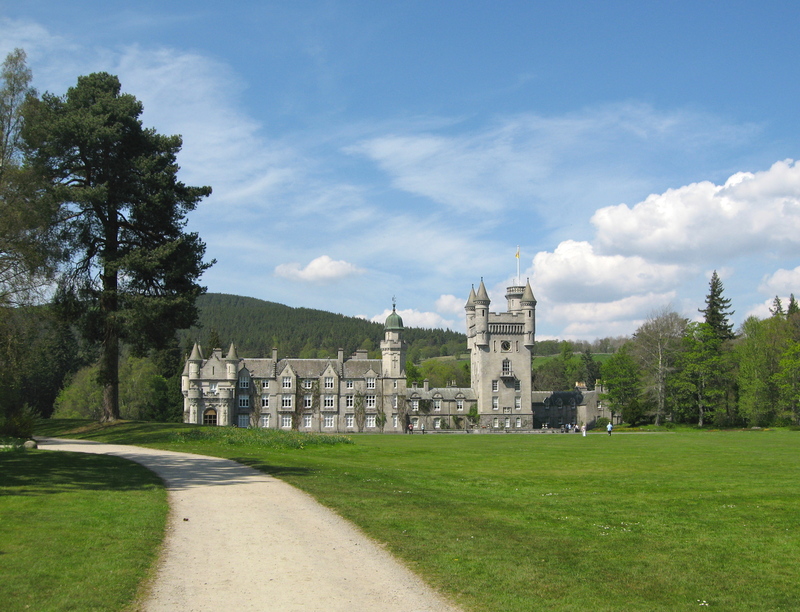 It is well used by the locals and visitors. You can feel the friendliness as soon as you enter. 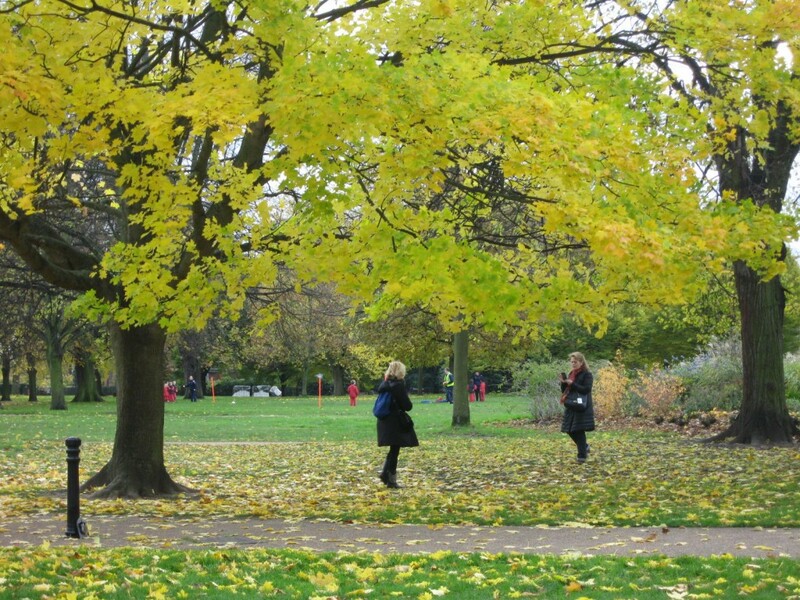 A friend captures the foliage and her friend in a photo, while a group of children practice their “football” (soccer in the US) in the background. Photo by me. No matter what the season, it just seems like a lovely space to meet a friend and spend an hour or two walking. 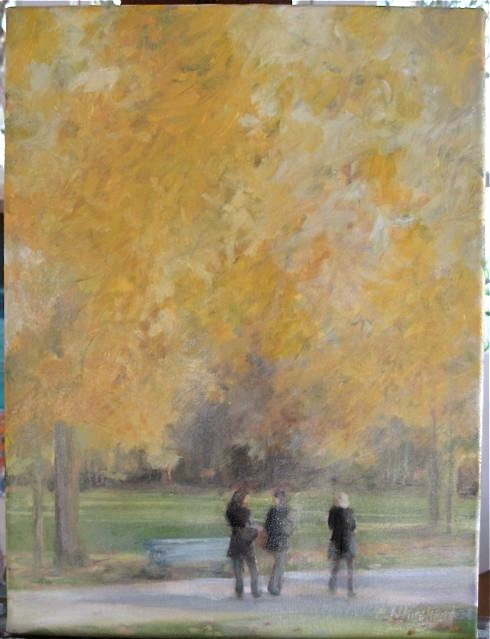 A painting of Kensington Gardens by me. 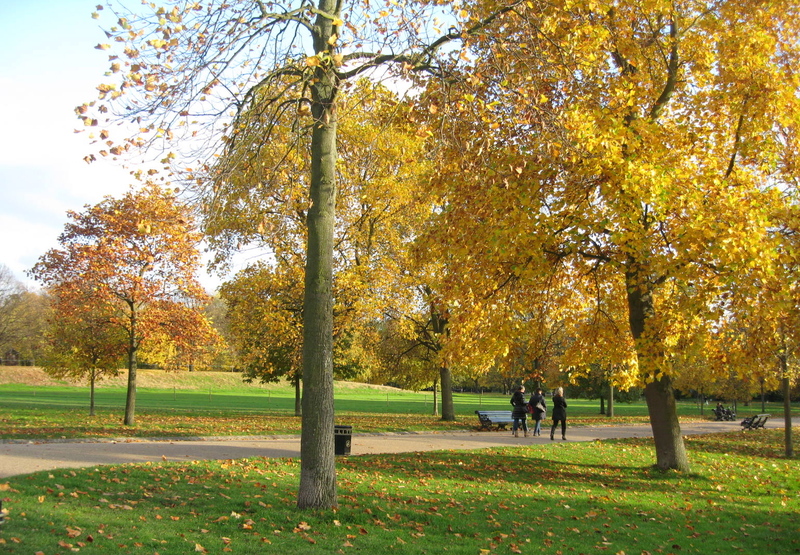 There is nothing quite like a stroll in a park with a couple of good friends, especially on a magically sunny day in London’s Kensington Gardens. 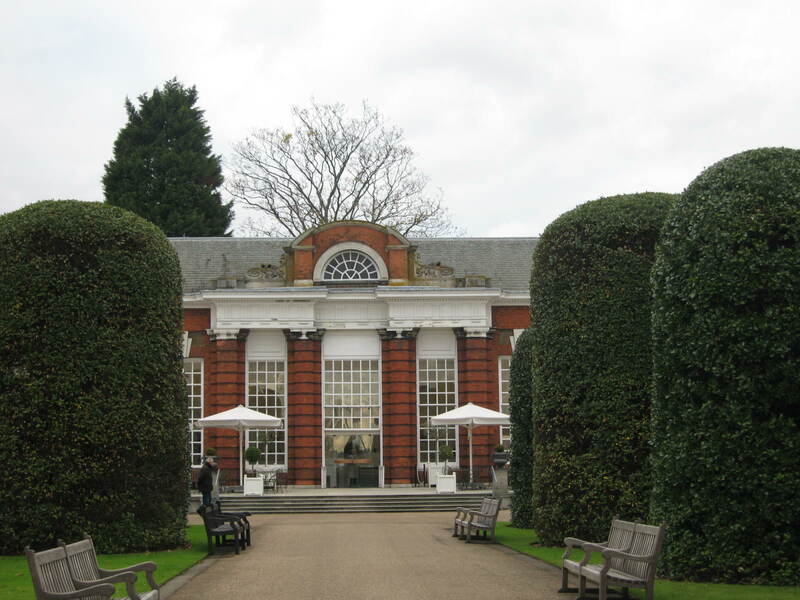 When I was there last autumn, I couldn’t resist a cup of tea in the nearby Kensington Palace tea shop, and then out in to the park. There were people strolling and biking, but these three women caught my attention. 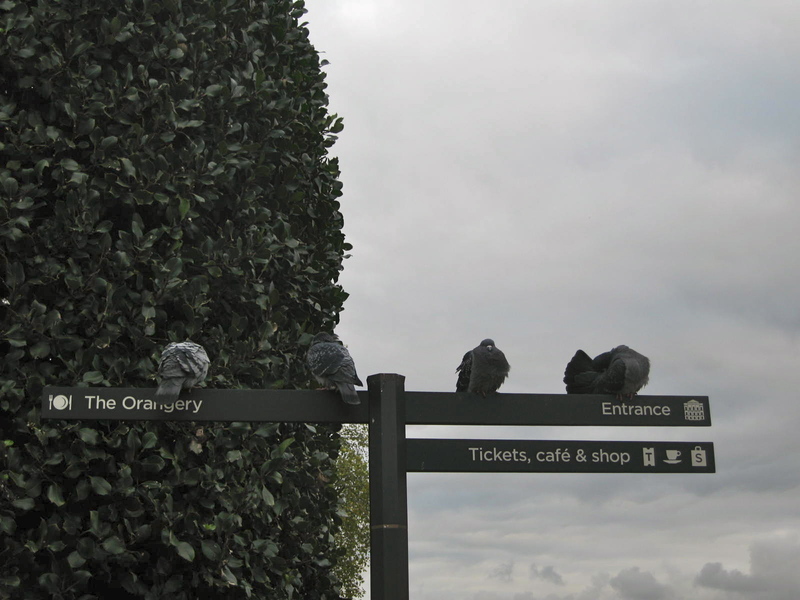 They could just as easily be me and my friends in Central Park. There is something so universal about the scene. 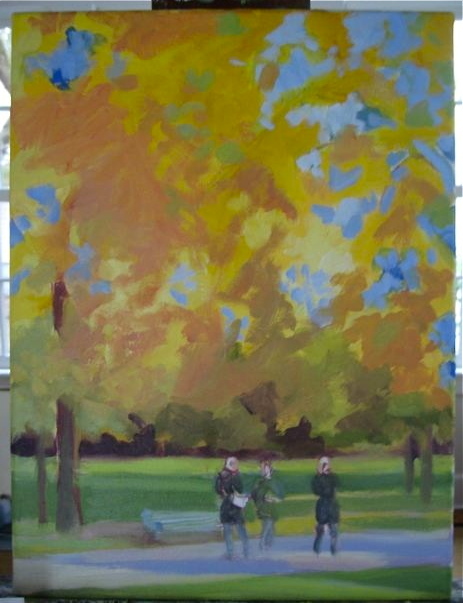 So when I started to paint the scene, I wanted the trees to become almost a halo around the three figures, setting them apart from the world around them. And I cropped it so that the women were the center of our attention. 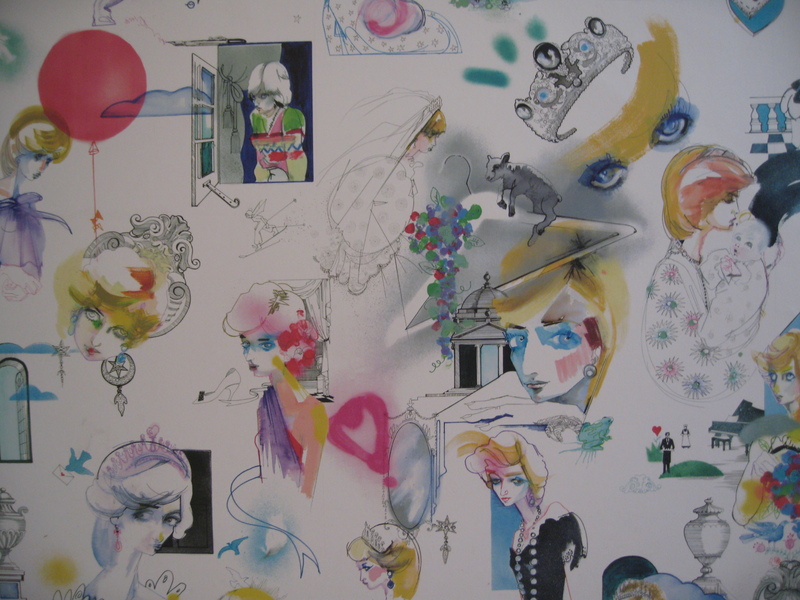 The three figures become front and center with cropping. 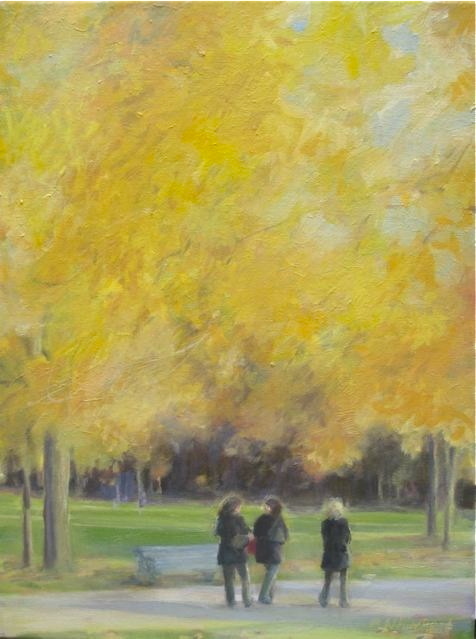 As I layered the golden branches, the recollection of mood took over, and the painting definitely took on an aura that was true. 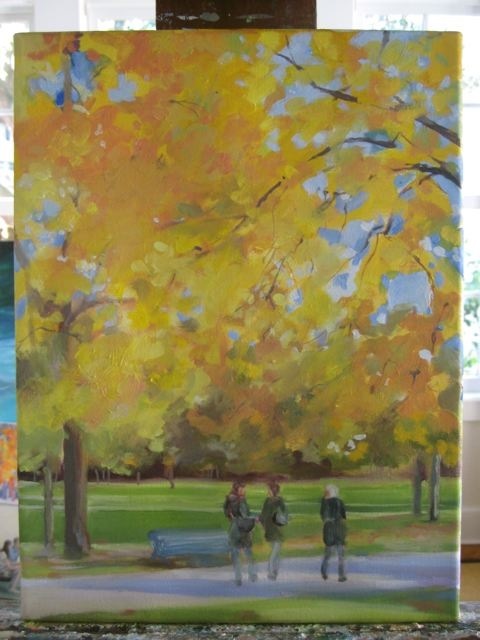 And detail was added that I knew would actually be part of a underpainting. This is the tricky part. Bolder strokes are added that I want to show through the haze. It is always quite scary to then brush over the image to create a mood, and decide how much to cover in the haze and where to remove the overlay of color. This is why I love oils. They are forgiving in the layering process. If it doesn’t work out, you can always add more layers. 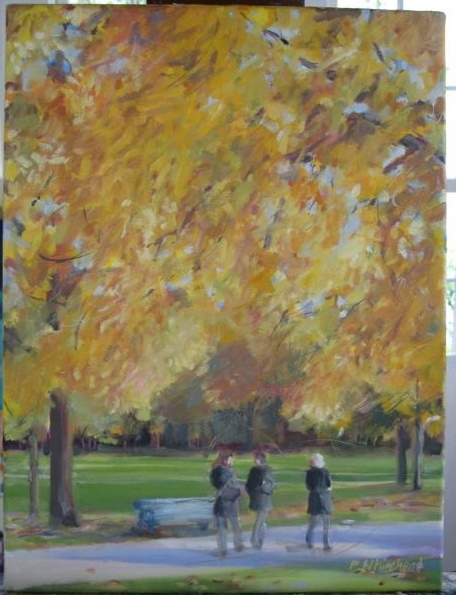 A soft layer of gold is added overall except over the figures. Finally, detail is added, some of the haze is gently removed, and I have accomplished the mood I originally hoped for. 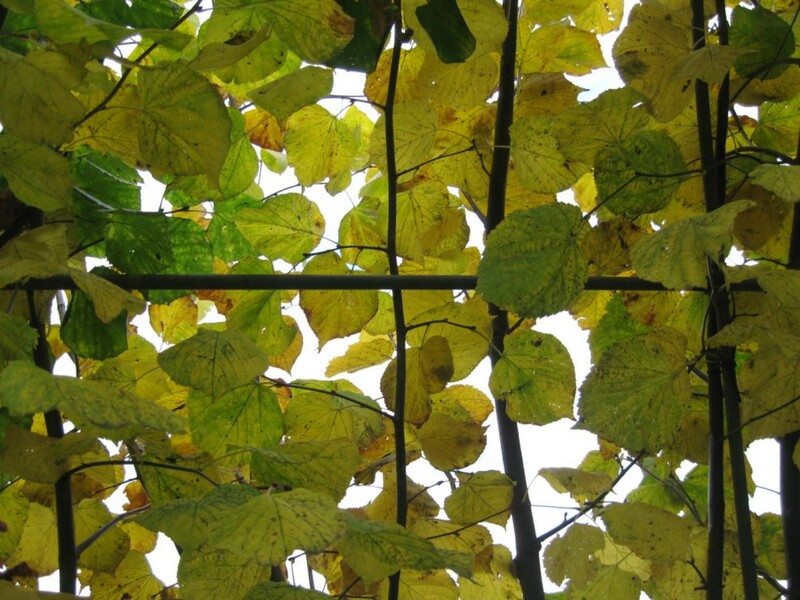 The friends are lost in their own world but encased in the glow of the autumn leaves. The perfect day with friends. 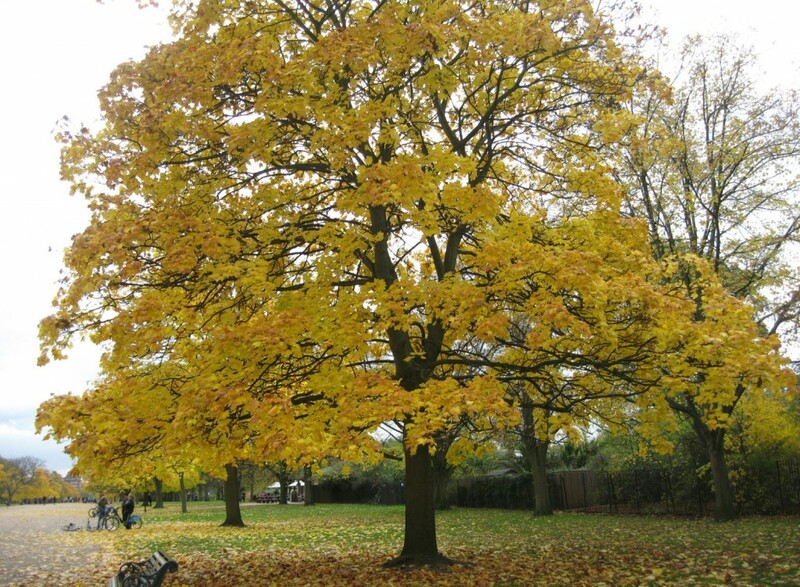 I have never been to the UK, let alone London, this late in the season. It may have something to do with My Beloved Brit’s fear of having to actually experience Britain’s cold, damp weather again. But this November visit I have found to be golden in London’s Kensington area on the edge of Notting Hill. Everyone was out to enjoy the last blast of color even if the skies were grey. The arbor at Kensington Palace’s sunken garden has definitely changed since I last saw it in June. 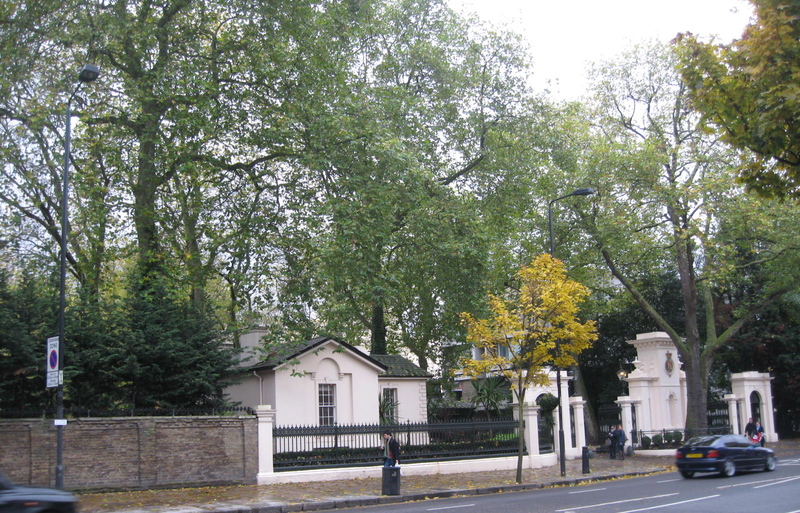 The air was quite chilly as I sat on a bench under the ash arbor at one of London’s most famous sites. 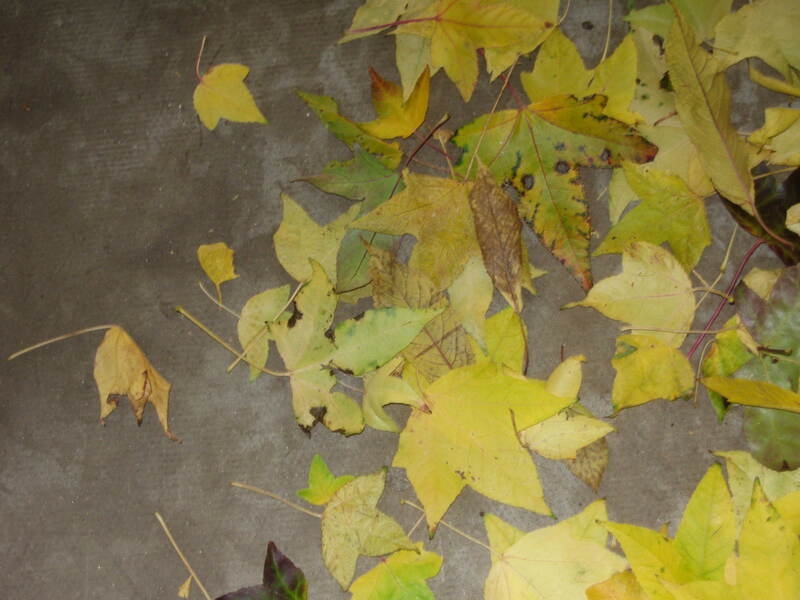 I asked My Beloved Brit when he called me on my mobile, “Why does 50 degrees in England feel so much chillier than 50 degrees in the southern United States?” He suggested it might have something to do with the damp, windy, grey skies that usually accompany the temperatures. The Grey Country? 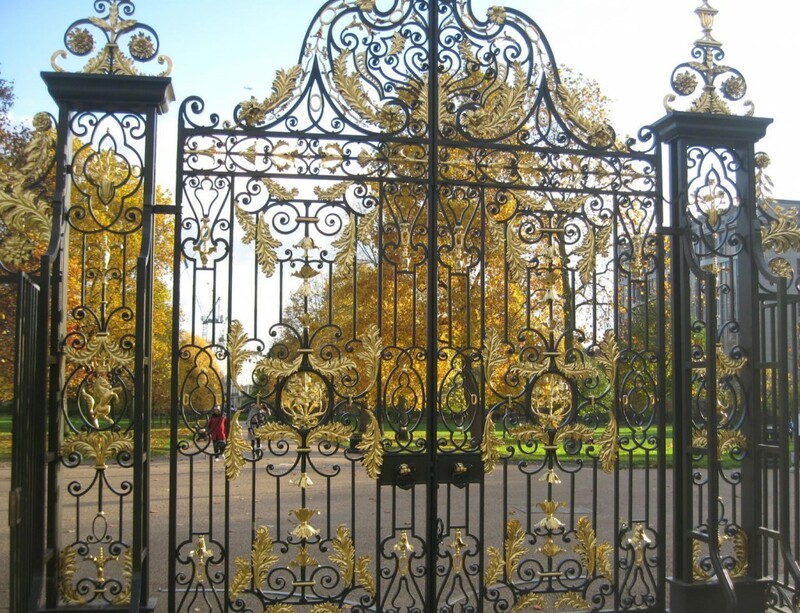 The gates at Kensington Palace, laced with gold inside and beyond. Photo by me. 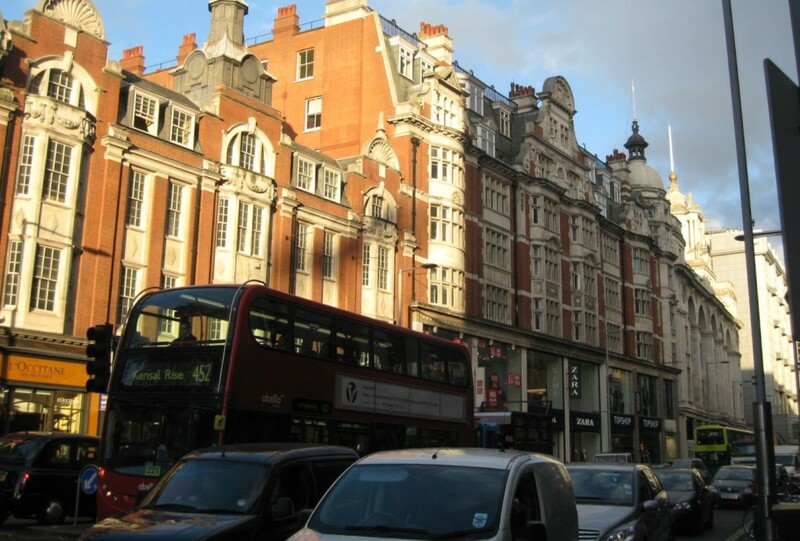 I was quite comfortable walking along Kensington’s roads with my hat, gloves and scarf firmly in place. It was golden. 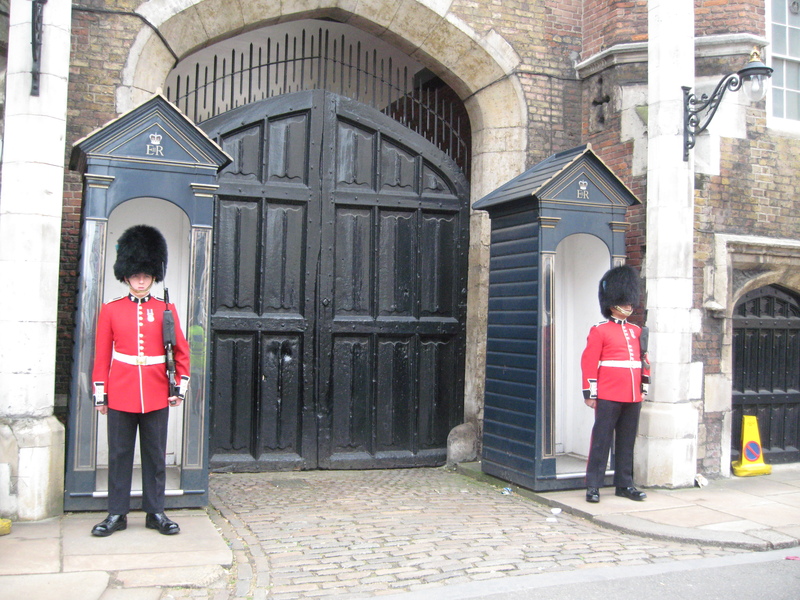 I had so many adventures in England it all seems a blur now that I am home in the US. I have been going through my photos recalling the details, and realize there were many really special days. 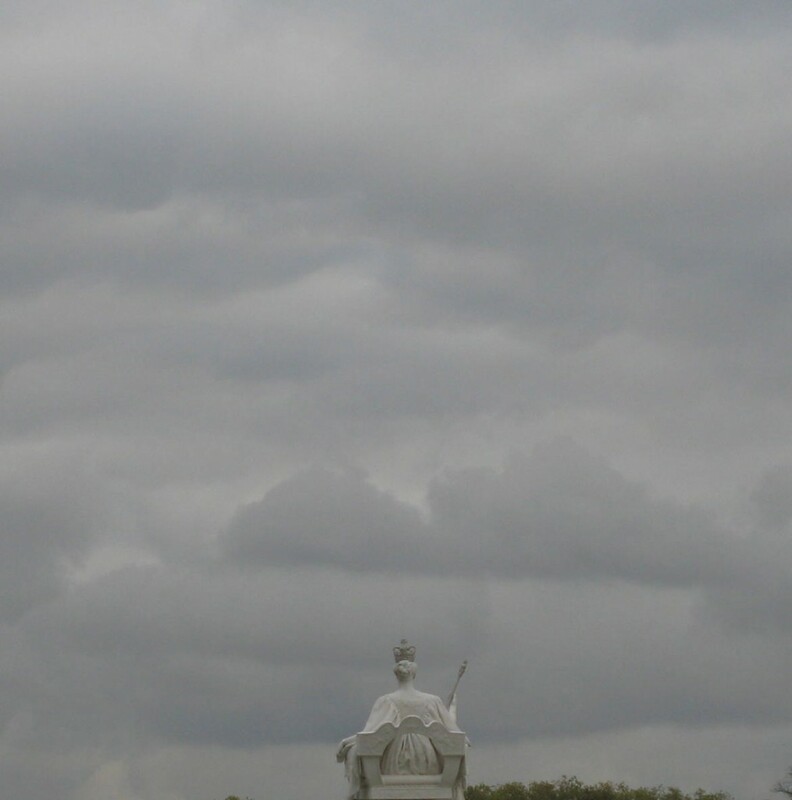 One in particular was a rather dreary morning in London during jubilee weekend. 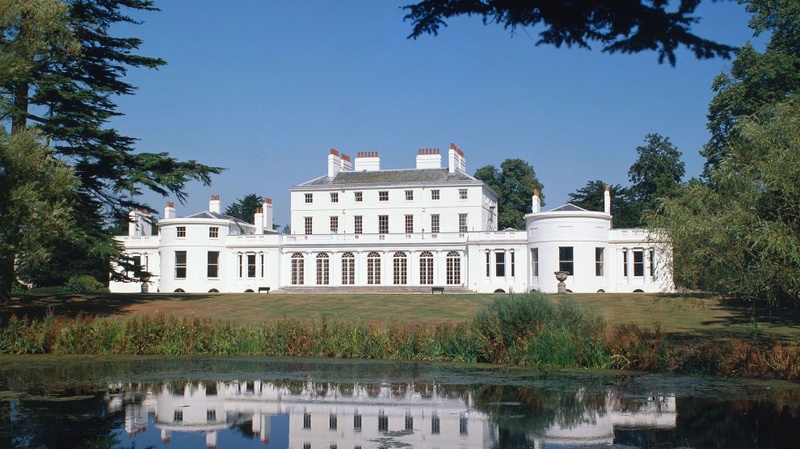 The Queen was busy at Epsom Downs for the races, so I decided to head down to Kensington and see the new renovation of the exhibition halls at the Palace. I decided to take the bus after learning how to get and use an “Oyster” pass. 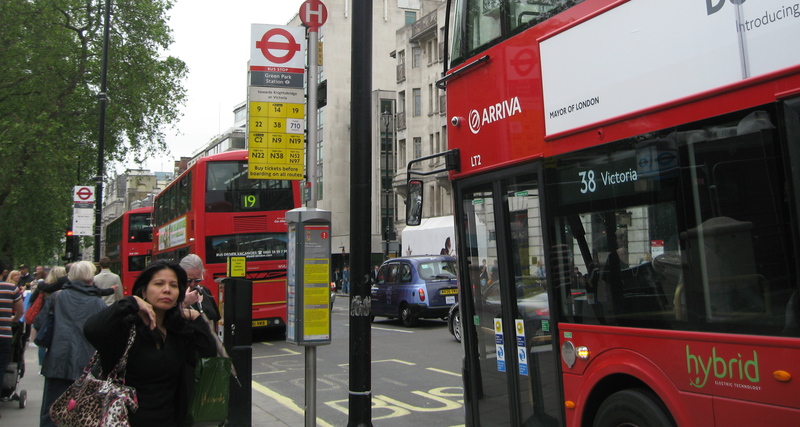 With the crowds coming in to London for the weekend, it seemed like the sensible thing to do, and it turned out it was easy to use on either a bus or the “underground”. I got to Kensington Palace at Hyde Park at 10am. 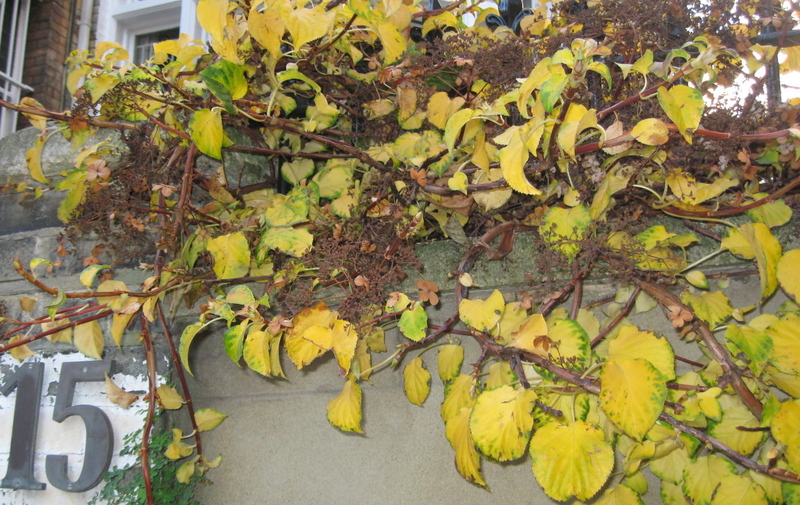 It was gray and misty but lovely and very quiet. Grey skies or not, people seemed to be out enjoying the park and getting on with their day. 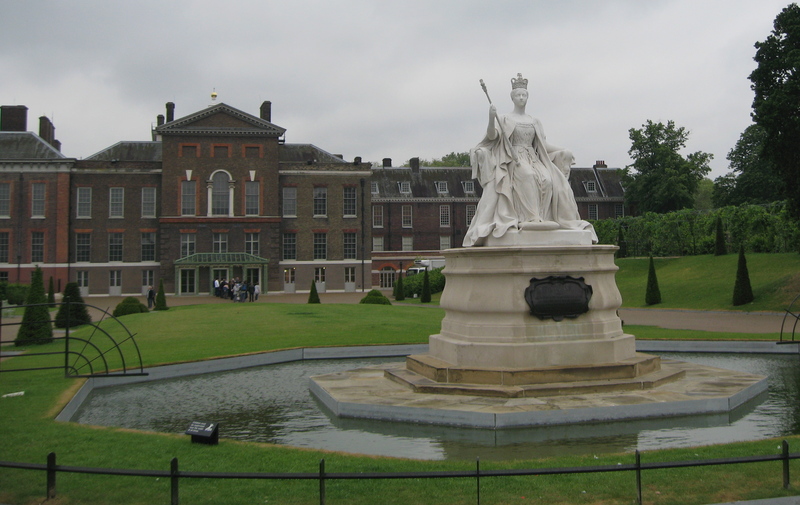 I did a quick tour of the entry with the statue of Queen Victoria and the sunken gardens, and then headed inside. 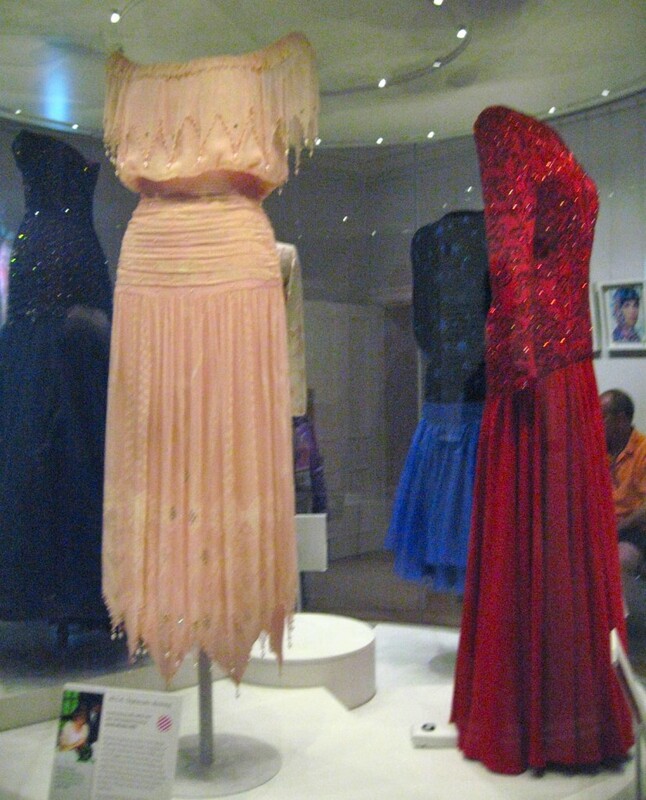 The new exhibit was wonderful. 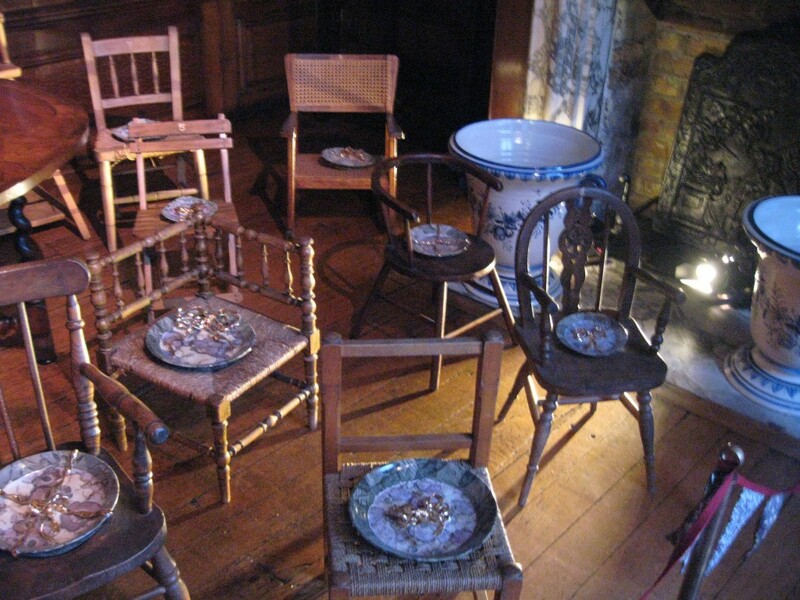 There were several areas to view and each had it’s own personality and distinct style. 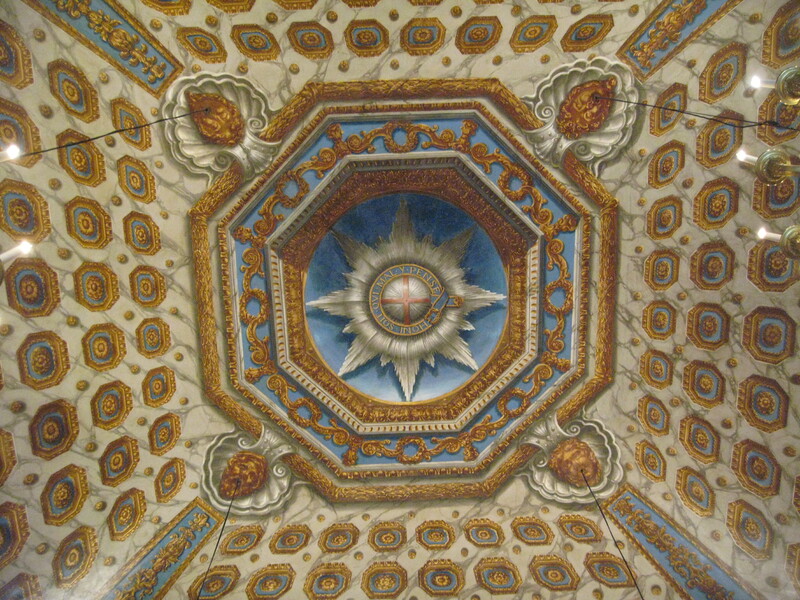 The rooms managed to combine the rich history of the royal apartments with a rather modern design element that kept it fresh. 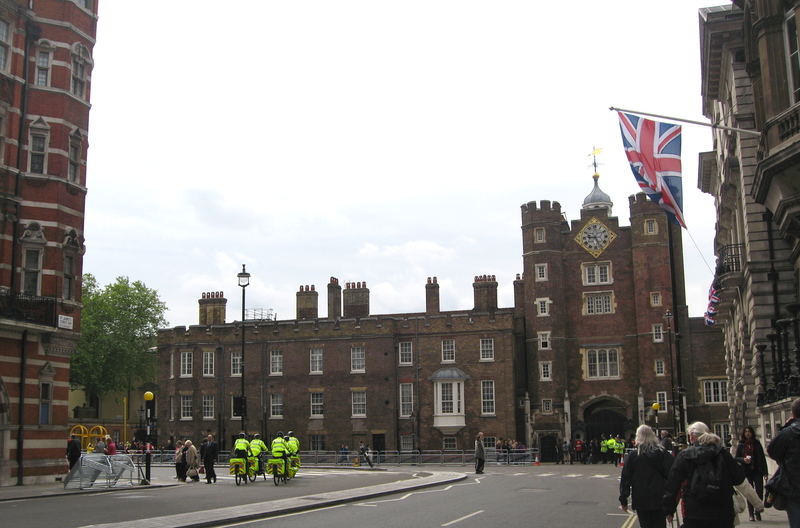 I rather like the way London has combined a modern sensibility with their historical past. I wonder at times if it was a controversial decision or whether the modern Brits just accept it. Everyone seemed quite enthralled by it. 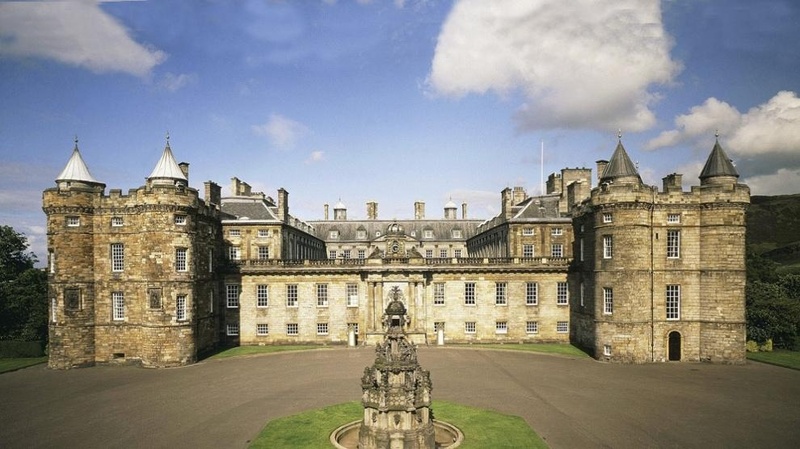 Either way it was great fun for me, and I actually lingered in many of the spaces, especially the state apartments George I and II. 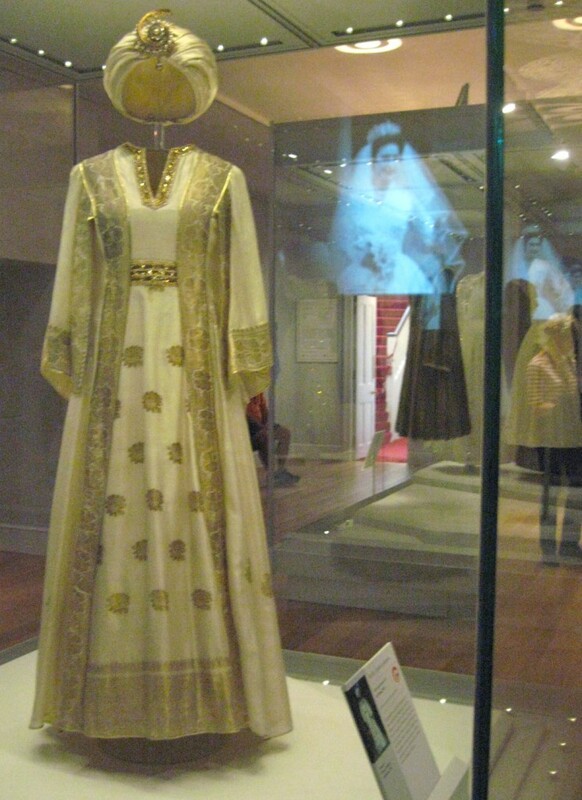 There was also a beautiful set of rooms in the exhibition “Victoria Revealed”, where you got a real sense of the life of the wife, mother and woman behind the crown. 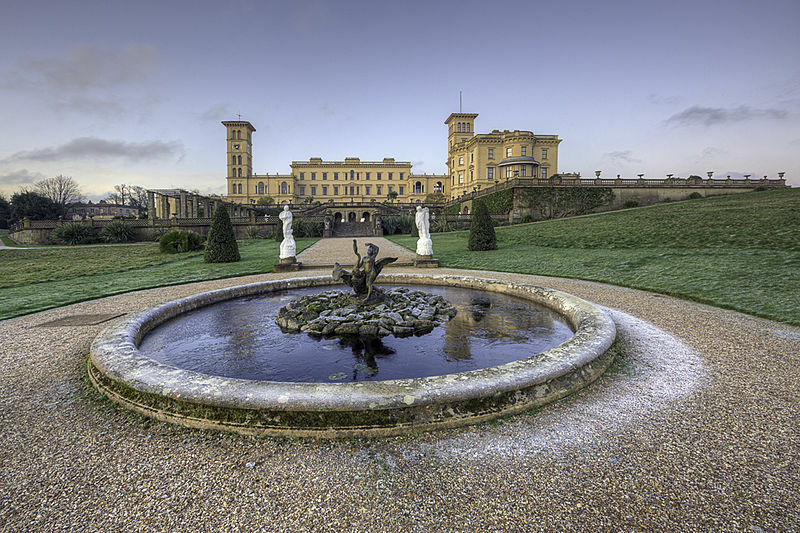 This is where Victoria spent her childhood and became Queen, and artifacts tell the story of her love for Albert and her great loss when he died. 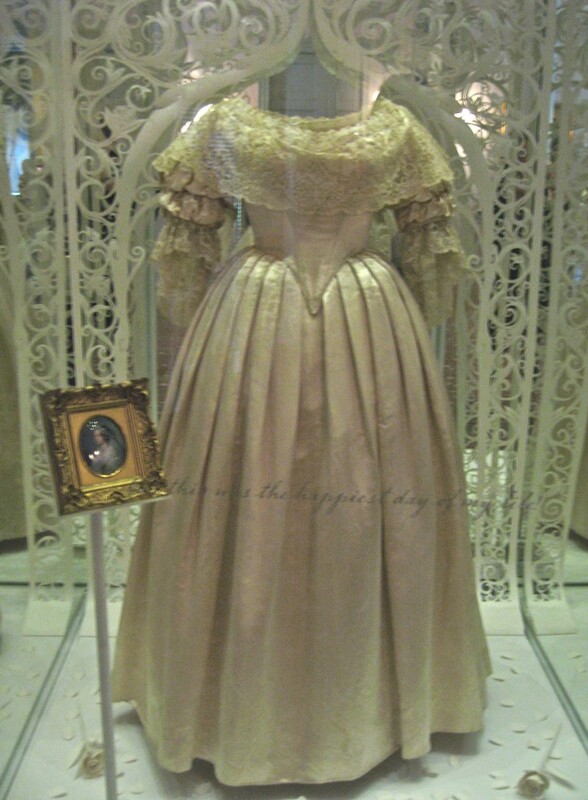 Victoria’s wedding dress. Photo by me. 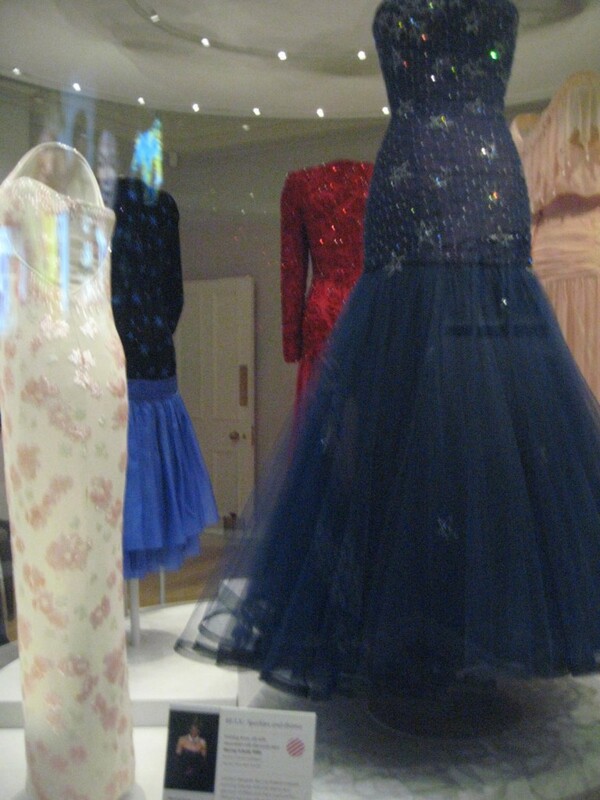 and a chance to see some of her most beautiful dresses. 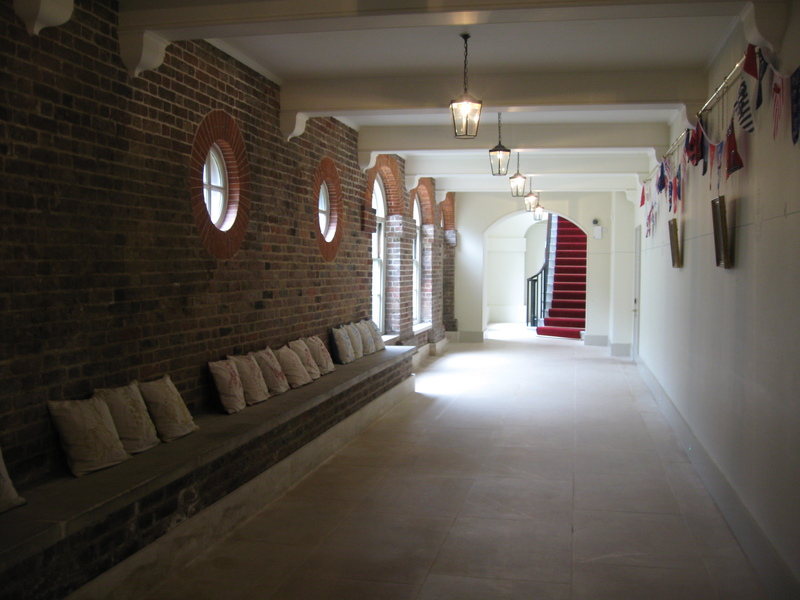 It’s interesting to think of the lives that have passed through these hallways. Prince William and The Duchess of Cambridge (Kate) are now preparing a large apartment in the complex to become their future home. And so the history will continue to the next generation. I did enjoy my visit, and loved the touch of whimsy and design detail that carried throughout the exhibition, like this directional sign for the public toilets. Those Brits do have a wonderful sense of humor. It is an amazing place. It makes the imagination run wild when you think who has walked these hallways. 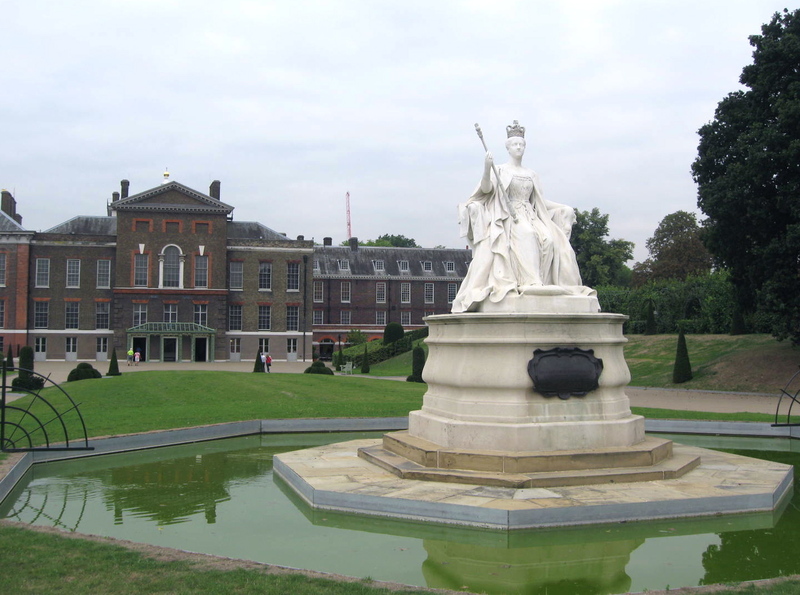 Kensington Palace with the statue of one of its most famous residents, Queen Victoria. Photo by me.